On each of the three days we’ve been here, I’ve been down to the little “beach” area down by the Dead Sea. It’s quite a trek down there, but there’s a well manicured path and at some point someone has popped out of a kiosk along the way and handed me a towel and a bottle of water. Actually Mo had already given us advice about the recommended process of taking a dip and his advice was backed up almost to the letter by the sign half way down the path. We fully intended to follow the instructions carefully. Once down on the “beach” - I use the word advisedly, because the shores of the Dead Sea are not really sandy and all of this has been brought in - I was happy to see two very attentive staff members there on duty, taking good care of everyone - particularly the children who came down to test the water. When one fell over and got water in his eyes, they were right there with an eyewash, plenty of drinking water and a soft towel. Because, actually, it’s not that easy getting in or out. 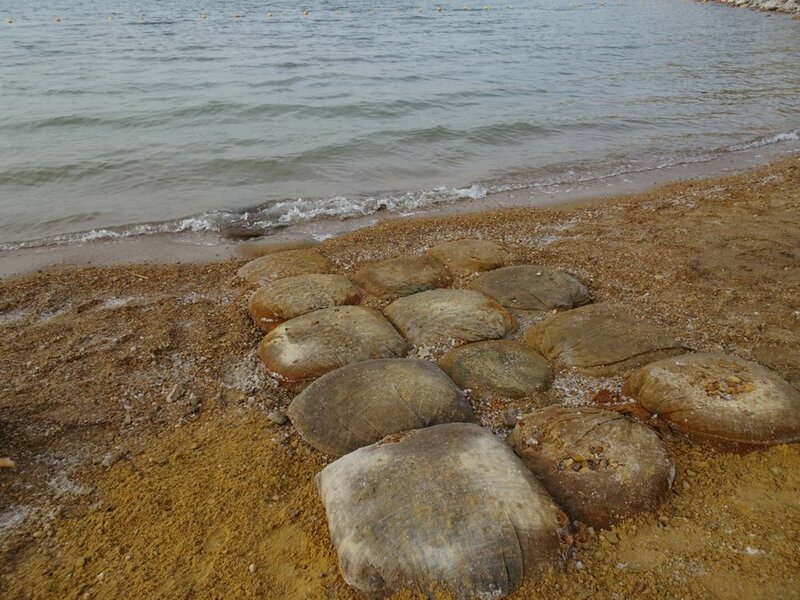 There’s a few sandbags there, forming a pathway into the water, but they soon run out and the sharp gravel and stones are very uncomfortable and unstable, making it hard to keep a balance in the waves. Once you fall over, that’s it…your feet float up and you have no choice but to be like a cork! It was only on our second visit that we discovered the rack of hotel-owned crocs, which made getting in and out of the sea so much more comfortable. The small waves were surprisingly strong and when standing on uneven ground, taking photos could be a little precarious. Still, we managed to get the requisite pics of ourselves reading the Jordanian Times even if we didn’t go as far as this group did and smoke a pipe whilst doing so! It feels really strange to be able to do nothing but float. Even in the shallowest water, it’s tricky to remain standing and the easiest thing to do is to simply lie back into the water and relax. Trying to swim or stand up again is likely to result in defeat and getting the smallest splash of the water anywhere in the eyes or mouth is nasty. After only a few minutes I felt a stinging sensation on my skin and there’s no doubt that the water takes effect in a surprisingly short time. But standing up and getting out of the water was, I found, the biggest challenge of all. The crocs float, so I learned to take those off - but then the stones hurt my feet and it was difficult to get a good foothold. A couple of times, I stumbled, but thankfully managed to keep my head well above water. A graceful exit, this was not! Nest step, then, was to get a handful of mud. Black, slightly sticky and a bit lumpy, it proved quite difficult to cover our whole bodies - certainly, we helped with plastering each other’s backs and only when I reviewed the photos did I spot the bits we missed! You’ll have to believe me that we did it! This blog is no place for swimsuit poses, even those covered in mud! The towels we were given on the way to the beach were clearly kept for this very purpose - they were not the same, first-class, pristine white towels we find in our bathrooms, which is just as well, for even after rinsing and then showering on the beach, they were all streaked with black traces of mud. At this point, the hardy ones amongst us were offered a salt rub by the staff, who had a bucket of salt and olive oil to massage into the skin to complete the process. We delicate flowers opted out of that stage, preferring to stick with a soft towel and look forward to a hot shower and the sweet smelling Dead Sea toiletries in our bathroom. 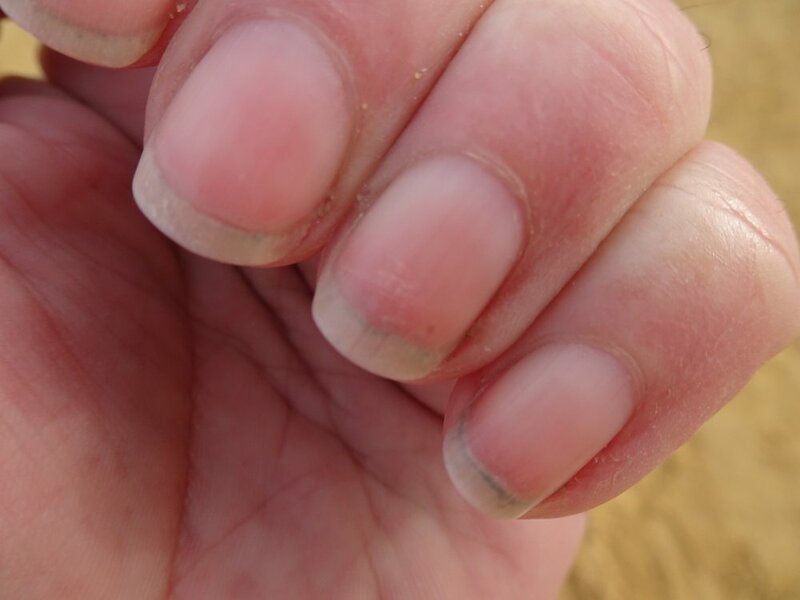 The result an hour or two later is the softest skin, a slight tingle and about an inch of mud in the basin where I rinsed my swimming costume.